Size : 11.4 x 18.3 inches. / 29.0 x 46.5 cm. Description :Beautiful double hemisphere from a Dutch Bible. 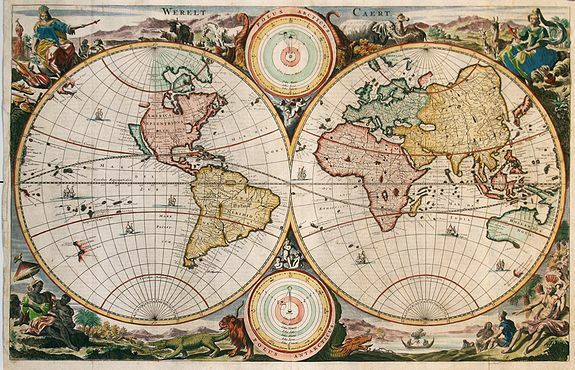 Surrounded by allegorical representations of the continents, based on Visscher. CALIFORNIA IS AN ISLAND with a flat northern coastline, Australia is partially mapped and there is only a hint of New Zealand. The northwest American and east Asian coastlines are incomplete. Diagrams of the Copernican and Ptolemaic solar systems rest between the hemispheres. This is the small version of this world map, without the banner title. Condition : The map has been repaired in the centerfold at teh bottom for 3 inches, and there are new pieces in the margins.